In this video, Ryan Young teaches us how to spin. Spinning is a way to add a restriction to a trick. If you attend a Freestyle Frisbee competition, you’ll often see competitors spinning before a big catch. It is one of the most common tricks in the game after the nail delay, air brush, and a few throws and catches. While the disc is in the air, spin around before you catch or take control of the disc again. The more spins you do, the harder the trick so spinning fast without getting dizzy is the key. Also, you need to track the disc as you spin. Ryan explains how to practice these skills. 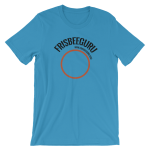 FrisbeeGuru - Watch, Listen, Learn.